The Promo Card sale has ended. The winners of the prizes have been drawn and notified via email. Congratulations to the grand prize winner - Jennifer T.
As of Tuesday, Oct 23 we have mailed out all Promo Card orders, but they may take a few days to be delivered via USPS. Please be patient for the arrival of your Promo Card. 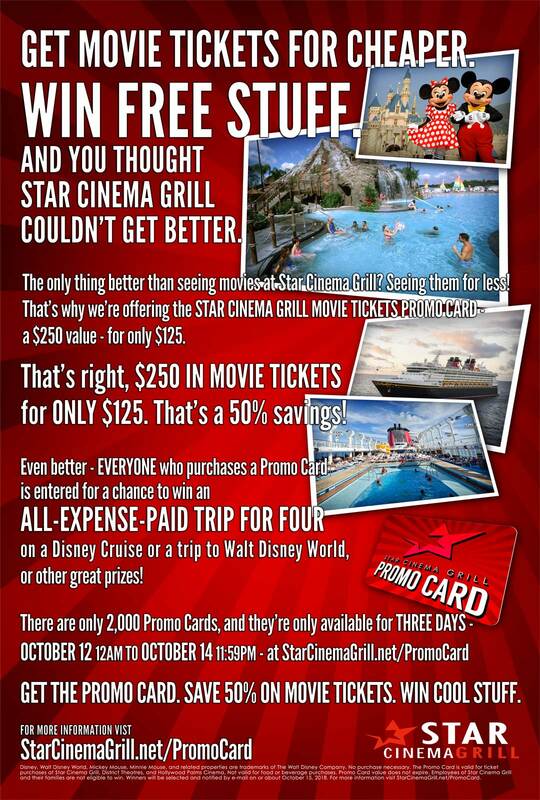 The Star Cinema Grill Movie Ticket Promo Card is worth $250 in movie tickets, but only costs $125 - that's 50% in savings. Use it just like a credit card online or at the box office to purchase movie tickets, for as many tickets as you like, for any show, any time, with no expiration or blackout dates - it's your $250 in movie tickets to use! Check back to StarCinemaGrill.net/PromoCard on October 12th to get yours - supplies are limited, and you won't want to miss out. Everyone who buys a Promo Card is entered for a chance to win an All-Expense-Paid trip for four on a Disney Cruise or a trip to Walt Disney World. Other prizes include two $1,000 cash prizes and ten $100 Star Cinema Grill gift cards. The winners will be selected and e-mailed on or about October 15, 2018 (employees of Star Cinema Grill and their families are not eligible for prizes). No purchase necessary - to enter the Disney Vacation drawing without making a purchase, complete this form. the Star Cinema Grill Promo Card is a great deal - and at 50% savings, you can't pass this up. The Star Cinema Grill Movie Ticket Promo Card is accepted at all locations in the Star Cinema Grill family nationwide! 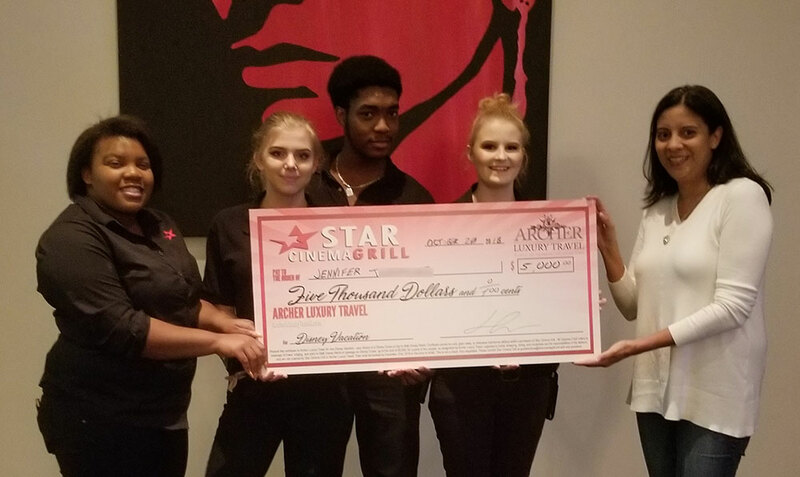 Winner will be presented with a certificate to Archer Luxury Travel for one Disney Vacation, entitling the winner to their choice of a Disney Cruise or trip to Walt Disney World. Certificate cannot be sold, given away, or otherwise transferred without written permission of Star Cinema Grill. "All Expense Paid" refers to coverage of travel, lodging, and entry to Walt Disney World or passage on Disney Cruise, up to the cost of $5,000, for a party of four people, as designated by Archer Luxury Travel; upgrades to travel, shopping, dining, and incidentals are the responsibilities of the winners and are not covered by Star Cinema Grill or Archer Luxury Travel. Trips must be booked by December 31st, 2019 or the prize is forfeit. Please contact [email protected] with any questions.